Find here the themes, items and colours associated with 14th wedding anniversary which you can combine to make a truly special and heartfelt gift for your loved ones. *While ivory may once have been given as a 14th wedding anniversary gift, it is now a poor choice ethically due to the decline of worldwide elephant populations. 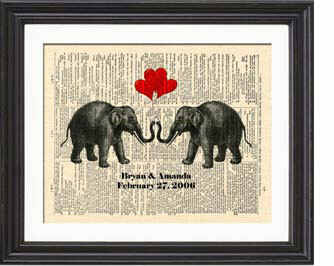 Instead, gifts that feature elephants are now often given as an appropriate alternative. The elephant in Hindu mythology represents luck and protection, with blessings brought down upon all new endeavours. An elephant's strength, stability and honour are also excellent representations of these relationship facets. Gold jewellery has a significance of prosperity, good health and power. The dahlia has a symbolism of elegance and dignity, representing the eternal bond of a couple on the occasion of their 14th anniversary. **The white or gold rose is a romantic alternative for this anniversary, in keeping with the modern and colour themes, and the symbol of eternal love that a rose represents.